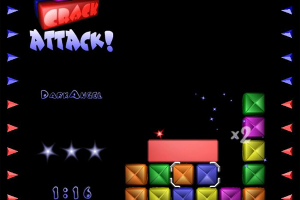 "New building blocks game for fans of the classic Tetris"
Crack Attack! builds on the famous Tetris game that has been around for a long time. Now, this version comes with added elements from Cristal Cavern and the like. The purpose is to line-up three identical coloured blocks horizontally or vertically so they will be eliminated from the stack and you try to impose the latter from reaching the top. Additional garbage falling from above can only be eliminated when adjacent lined-up blocks get removed, so it surely will get more complicated as time goes by, because the speed by which your stack grows from below will also raise. The complexity of the game is not limited to this, there is plenty more to discover, so get ready to play Crack Attack! and find it out for yourself. Be aware though, many people got addicted to the original Tetris Attack, so don't say you didn't get warned.